Hi everyone! I need your help to win an unboxing contest that Best Buy is running on Facebook, and it’s for a good cause. Since I do a lot of those, I thought hey, why not enter? There are two grand prizes of $2500 CAD each, awarded as Best Buy gift cards. Since we’re coming up on Christmas, sharing the grand prize if I win makes sense – so I’ve publicly committed to donating half of the prize ($1250) to kids involved with Big Brothers & Big Sisters of Canada. My mother works for that organization, and I’ve seen first hand the needs that some of these families have. She works with the in-school mentoring program, which pairs younger kids with senior citizen mentors. Apparently the kids are Nintendo Wii-crazy, and it’s an activity the seniors and kids can do together, so I think what I’ll do is buy as many Nintendo Wii bundles as I can with $1250 (it should be at least five of them). I'd really appreciate the support of the Thoughts Media community, because - and I'll be blunt here - Twitter is such a noisy medium that every though yesterday the message about this contest went out to over 5000 people from three different people, nearly zero votes came as a result of it. I'm currently #3 in votes, but I could easily take a dominating lead if even 20% of you reading this decided to act. Please help! Here’s how you can help me, and the kids, win – oh, and enter to win a $150 gift card yourself! Log into Facebook, and visit the Best Buy Unboxing Day Contest Site. Click Allow when the app asks for your permission. I’ve noticed there’s a weird bug with Internet Explorer 8 where it loops the process for almost a minute, so you may want to use Firefox or Chrome if you run into trouble. 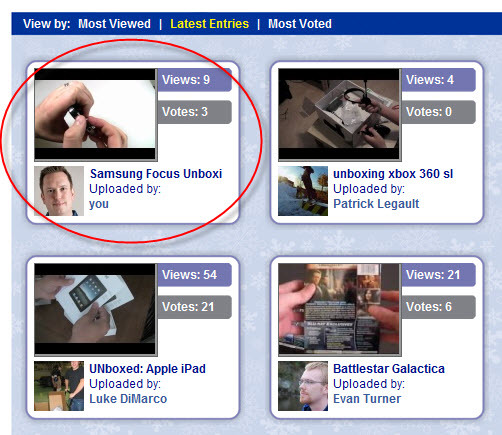 Find my Samsung Focus video (see above) and click on it, then click on Vote in the window that pops up. You’ll need to fill out a little form; if you live outside Canada and don't qualify for the gift card, just put in whatever bogus information you want. Return to that contest site every day to vote – you can vote once every day up until December 31st. The winners will be announced January 3rd, 2011, and if I win, I’ll announce it here and provide details and photos of the Wii’s I purchase. (And for the Windows Phone Thoughts readers, I'll be doing a "real" unboxing of the Focus - that was just a simplified, quick version. I've got some serious concerns about the screen...).